A lamprey symbiont attaches itself to the cerebrospinal fluid of a host, injecting him with psychedelic visions. 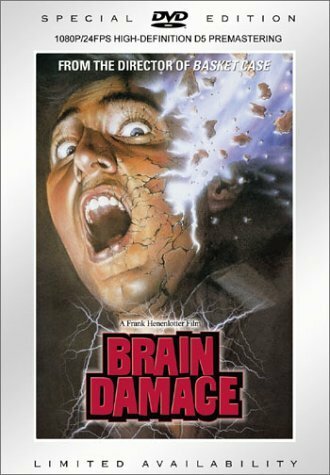 If THAT premise doesn’t get your juices flowing, you won’t care for the impudent, weirdly compelling little movie, Brain Damage. The follow up to Basket Case, Frank Henenlotter, on a bigger budget and a bigger, better idea, tops his previous effort. And that’s saying something. Basket Case is an undeniable gem, even if the creature’s obviously operated by hand puppet. In Brain Damage, “Alymer” is hungry, and has escaped his owners’ seedy Bronx apartment unit and taken up residence at the abode of one Brian (Rick Hearst). The creature, a kind of tubular geoduck/rotten ice-cream cone with teeth, affixes itself to his neck, giving him unbelievable highs. Under the influence, Brian heads over to the local scrapyard to take in the spectacular drug-induced auras, the night sky and rusty wrecks lit up with his visions. But it’s there, the creature’s lust for human brains takes hold, sucking the cerebrum out of the facility’s hapless security guard. Brian, it turns out, has made a Faustian pact with Aylmer: in exchange for psychedelic highs, he’s the courier that gets the monster into closer proximity with human victims. And it’s bad enough the juice is taking its toll. An allegory for heroin withdrawal, Brian gets desensitized to the infusions and his relationships (including that with girlfriend Barbara) suffer for it. But it’s the heavy moral toll of his nightly excursions that’s dragging him down, an accomplice to a creature that while lovable, has an appetite for human flesh. It’s this appetite that provides Brain Damage with some incredible kills. In a pharmaceutical fog, Brian steps out into a punk club, suited up like a Wall Street salary man, and meets up with a lady who’s good to go. They step outside, she unbuttons his pants, goes down and Aylmer goes to town in one of the most audacious and disgusting scenes in all of horror. Gonzo, go-get-’em horror and a near-classic. This entry was posted in Black comedy and tagged 80s horror movies, Comedy horror by Really Awful Movies. Bookmark the permalink. Basket Case is brilliant, schlocky, lots of fun. I’ll be checking out Brain Damage for sure. Love the premise. Thanks for pointing me to this one! Thanks for following/enjoying the site, Jade!